Has it really been an entire decade since Team Ico first pinged our radar? In that time, the Sony development outfit has given us just two games, but they’ve been two of the most beloved, highly regarded adventures ever to appear on the PlayStation 2. And now, finally, they’ve been packaged together in what may be the most eagerly anticipated HD collection to hit the PS3. The Ico and Shadow of the Colossus Collection has been years in the making, and it’s something we’ve wanted to see ever since Shadow of the Colossus overtaxed our aging PS2s in 2005. Of course, games have gone through a lot of changes since then – but in the intervening years, the industry still hasn’t really produced anything quite like Ico or Shadow of the Colossus. In HD or otherwise, the games still stand as easily recommended must-plays, whether you’re a newcomer or a fan clinging to nostalgia-clouded memories. And the collection, if nothing else, is the best they’ve ever looked, even going so far as to add slick 3D visuals for those with the TVs to support it. That’s not to say the games don’t look a bit dated, though. In particular, Ico and his herky-jerky stick-man movements take a little getting used to, as do some of the game’s environmental textures, which can look kind of blurry close up. The blurriness is even more pronounced in Shadow of the Colossus, although it could be argued that, given Shadow’s soft-focus, ethereal look, having backgrounds that weren’t a bit blurry would detract from its unique appearance. However, that wouldn’t excuse the fact that – while looking much sharper and running at a much smoother framerate than its PS2 predecessor – Shadow still suffers from occasional visual hiccups (like textures that pop in suddenly) while you’re riding across its vast landscape. Those issues aside, the games still look stunning, in large part because their art direction was always more about creating a moody atmosphere than about cutting-edge visuals. Ico’s colors are just as vibrant, its shadows are just as menacing and its characters are just as fragile and sympathetic now as they were in 2001. Likewise, Shadow of the Colossus still retains its sense of foggy melancholy, although its vast, open landscape is even more impressive to ride through now that it doesn’t visibly chug as it streaks past. It also benefits more from 3D than Ico does, as the addition of depth makes its enormous sense of scale seem more tangible. Things like the bridge to the game’s central temple, for example, now look less like abstract background scenery, and more like massive, looming objects that just happen to be far away. 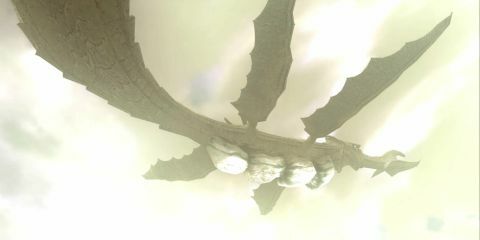 It’s a cool effect, and it makes the battles against the towering Colossi feel a lot more urgent and vertigo-inducing than they are otherwise. Visuals aside, the games play about the same as they did on PS2, which is to say they manage to be hugely engrossing in spite of somewhat fiddly controls and a few surprisingly frustrating challenges. They also feature just 10 save slots per game, which seems like an unnecessary throwback There’s one key difference, however, at least for American gamers: the Collection features the European version of Ico. That means you’ll encounter some noticeably different (and sometimes more difficult) puzzles and room layouts, although it also means that all the dialogue gets translated on the second playthrough – and that there’s a two-player option, for those who’d like to try Ico with co-op. If you’ve never played Ico, well, you should. It’s a puzzle-focused adventure that revolves around a young boy – Ico – who’s brought to a mysterious castle and entombed alive because he was born with horns. He soon breaks free, however, and meets a pale, fragile princess, Yorda, who’s constantly hunted by intensely creepy shadow monsters. Together, the pair attempt to escape the castle, something that involves Ico trying to protect Yorda (who’s essential to clearing certain obstacles) while opening paths for her (and, more often than not, literally pulling her by the hand) across the treacherous, crumbling architecture. A sidekick so helpless might evoke rage in just about any other game, and Yorda can certainly be annoyingly slow and unresponsive sometimes. But there’s also something about her – whether it’s her delicateness, her obvious fear or her seeming determination to overcome the first two – that makes her sympathetic, and makes us want to keep her from harm instead of pushing her off a cliff. Aside from that crucial, symbiotic dynamic, Ico’s puzzles – which tend to involve a lot of climbing, exploration and experimental switch-pulling – are enjoyably challenging, and the occasional bouts of smacking shadow-demon kidnappers around with a two-by-four keep things from getting too placid. It all makes for an unusually sweet (if sometimes frustrating) romp that’s still achingly pretty after 10 years. It also comes with a handful of high-value Trophies that are relatively easy to get, so that’s a plus.